With the Easter holidays coming up, Ed and I are always on the lookout for things to do with the children to get them out of the house. Mighty Claws adventure golf is located behind the Tesco Extra on Castle Lane in Bournemouth. 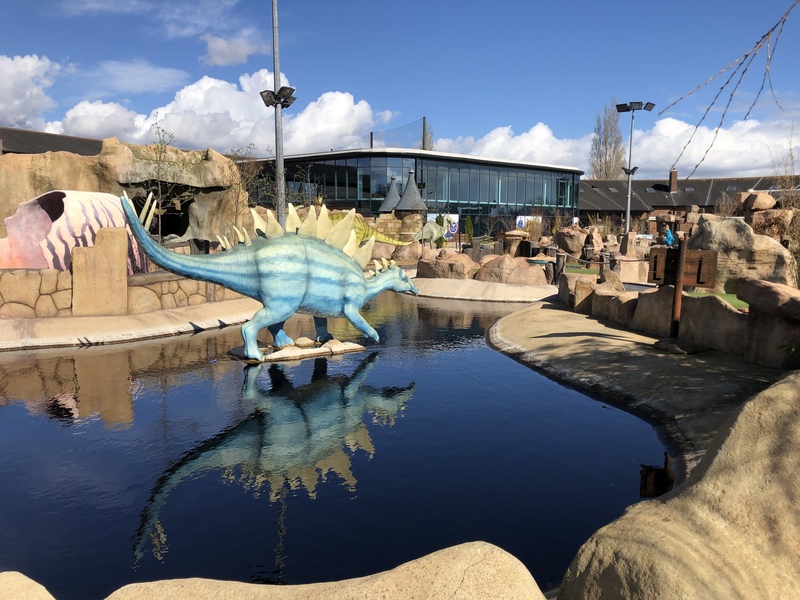 Part of Playgolf, the dinosaur themed 18 hole course was a total hit with the kids when we visited for a review visit recently. Each hole has something to look at including a variety of dinosaurs, a waterfall and even a volcano. To add a bit of a challenge, some of the holes go across the water but don’t worry if you or your little ones aren’t that good a shot as there are fishing nets to hand in order for easy retrieval of the balls. If you fancy keeping track of who’s in the lead as you go round the course, scorecards are available from reception along with a selection of clubs for different heights – even Benjamin was able to find a club he could use! We were really lucky with the weather when we visited. It hailed for all of two minutes just before we started and was then lovely and sunny with a light breeze for the rest of our game. I would say the course isn’t necessarily suitable for all weathers, as it isn’t undercover and you would get soaked if it rained heavily, however the venue does have a restaurant on site serving breakfast, lunch and dinner as well as hot, cold and alcoholic drinks, so you could always wait it out until the shower passed. Tickets can be purchased in advance or on the day, with group discounts and family tickets available. We were provided with a complimentary round of golf for the purpose of this post, however all opinions and images are my own.